CommuniGator Help SiteGator Product SuiteGatorCreator What is Gator Creator?What Gator Creator can do for you! 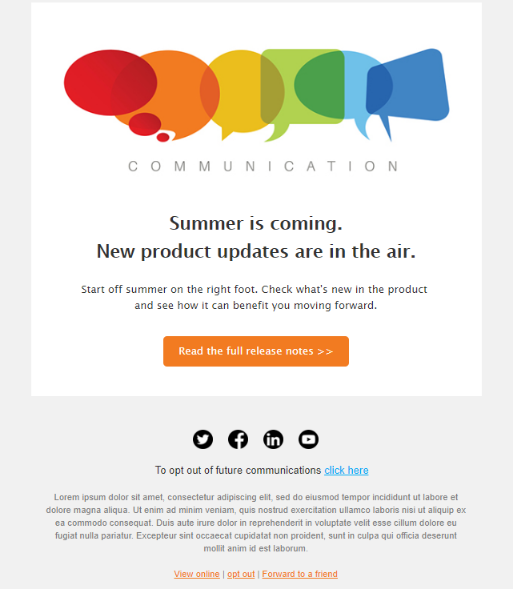 Gator Creator is the starting tool for sending out email campaigns and improving customer connections. It works in tandem with Gator Mail allowing you to create interesting, captivating campaigns to build a customer base, and keep those customers coming back for more. When creating your email, you first have to choose whether to create with the Drag & Drop Editor, or with the html editor. The Drag & Drop Editor provides a simple and effective campaign creation process, without needing to have any knowledge of html. As you can see below, the Editor allows you to literally drag and drop in 'blocks'. These blocks add content which are easy to edit and personalise for your own business. For example, adding a button block places a button wherever you place it on the page. It could take you to a website, a web capture form, or another email, it is entirely up to you. If you wish to write your content in html, you can do so with our html editor. It allows you to do all the same things as the Drag & Drop Editor, except you can create more bespoke designs for your emails. This is possible as using html allows a greater breadth of customisation, whereas the Drag & Drop Editor restricts you to templates. As you can see below, there is a box for adding in your html code, with a 'text' version tab and a 'details' tab also avaliable. The 'text' tab enables you to create a text version of your html email. We recommend doing both to ensure readability on all platforms. For more information please see the other GatorCreator help articles.